Large and imposing, the mastiff is a docile giant, despite its use throughout history in warfare, bear baiting and utilization as a guard dog. It’s also an ancient breed that has been a part of the foundation for several breeds of dog. One of the largest dogs registered by the AKC, the mastiff should stand at least 30-inches tall at the shoulder (females at least 27-½ inches) and can weigh up to 250 pounds without being overweight. The one-time world record for heaviest dog belonged to a mastiff named Zorba, who weighed a massive 343 pounds and stood 35-inches tall. Large mastiff-like dogs appear in artwork dating to 6th Century BC (and perhaps even earlier), and throughout history the large dogs have been used for fighting and guarding. From lions, tigers, bears and gladiators to use in war by the Britons and Romans, mastiffs fought ferociously. However, as vicious as they were in battle, they were just as gentle with and protective of their owners. It’s been noted that in battle, mastiffs would fight the enemy, but seemingly knew for which side they fought – and when the battle was over, they would return to a docile state. If injured, it was said that a mastiff’s owner could care for the dog, even in a heightened state such as war, and without fear of being bitten. The breed’s loyalty is also documented – they were known to stand over and protect their fallen master as the battle raged on around the corpse. The name mastiff was often used as a general term for large, massive dogs in ancient times. 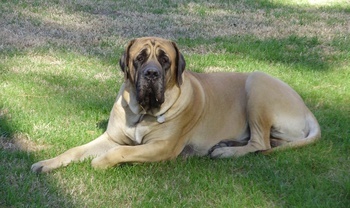 Today’s version, with its large size, enormous head with black mask, is often called an “English” mastiff, although English has been dropped by many registries. Because of their use in warfare by the Romans, many of today’s large working and guard dog-dog breeds descend from the mastiff. As the armies moved throughout Europe conquering lands, the massive beasts were often crossed with local dogs that specialized in a task – their addition added size and strength to the progeny and helped, eventually, to develop many modern breeds. Today’s mastiff has a short, straight and coarse coat in fawn, apricot or brindle, and possesses a black mask – the darker the better. Their head is huge and well muscled – as is the rest of their body. While large and imposing, their temperament should be a “combination of grandeur and good nature, courage and docility” without a hint of viciousness. Because of their grand appearance, docile and even-tempered demeanor, moderate exercise and minimal grooming requirements, mastiffs have become popular in North America – ranking 26th in registries with the AKC in 2013. They are also very good with children, and if taken on walks, can live in the suburbs with a small yard. Their large size presents many problems for the mastiff and their owner, however. Namely, puppies grow very fast and owners must take care when feeding and exercising them to avoid effecting growth rates, joints and other skeletal issues. Due to being a large dog, the mastiff’s lifespan is typically short – averaging 7 years (although many reach 10 to 11 years of age). Health problems include those that usually effect large-breed dogs, including hip and elbow dysplasia, gastric torsion, thyroid problems and osteosarcoma. To help ensure as healthy of a puppy as possible, be sure to buy from a breeder that has tested for hip and elbow integrity, as well as known genetic mutations. At Paw Print Genetics, we offer a panel that screens for three genetic mutations common to the mastiff. Included in the panel are degenerative myelopathy, a neurological disorder, and two eye issues – multifocal retinopathy 1 and progressive retinal atrophy (group A). By screening for these genetic mutations before breeding, you can eliminate them from your lines and produce healthier puppies.